Each asset class has inherent attributes. The table below highlights the characteristics and risk and return for the various asset classes. Choosing where to invest your money is a difficult decision and will depend on many factors, including your overall investment objectives, risk profile and the amount of time you have to invest. It's therefore best to seek the advice of a qualified financial adviser who can help define your personal situation and identify the appropriate asset allocation. Includes bank deposits, cheque accounts and cash management trusts. Lowest level of risk and return of all the asset classes. Suitable for investors who have a short-term investment outlook or low tolerance for risk. As the investment provides interest only, the investment value may not keep up with inflation. Generally includes income-producing assets (Government bonds, fixed term deposits, mortgage trusts) although the capital value can rise or fall in certain circumstances. Fixed interest is more volatile than cash but still a relatively stable asset class. You receive your initial investment amount back at the end of the set term. Investments often don't keep pace with inflation as only a pre-determined, fixed amount of interest is paid on the initial investment. Includes residential, industrial and commercial property. 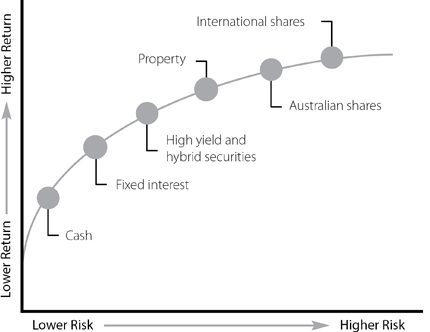 Property investments have a higher risk than fixed interest but less than shares. Can provide tax-advantaged income from rent received and can include capital growth. Involves the purchase of a stake or financial interest in a company, enabling you to share in the profits and future growth of that company. Shares are the most volatile asset class, but historically over long periods of time have achieved on average the highest returns. Most investment specialists believe that asset allocation is vital in generating returns. Although there are many investment products in the market, it is the asset allocation rather than the actual investment products which differentiates high returns from low returns and will enable you to reduce the risks involved with investing. Generally speaking, your asset classes will not all react in the same way. It's likely that some asset classes will have above average returns in a particular year, while other asset classes may have below average returns for that same year. Asset classes are often split into two categories: growth assets and defensive assets. Defensive assets provide long-term stable returns with lower volatility. Examples of defensive assets are fixed interest investment options such as debentures, bonds and bank bills and cash investment options which include bank bills and bank deposits. Growth assets are investments that offer higher returns over the long-term but at the expense of less stable returns. Examples of growth assets include property and shares. Investment risk refers to the level of volatility, or fluctuation in investment, returns, you're prepared to accept. The risk of losing your initial investment – for example, if you invested in a company which is poorly managed and subsequently went bankrupt, you could lose your total investment. This is a rare occurrence, however, cases such as Enron show that there is some possibility of this occurring. The risk of receiving a lower than expected growth return – for example, the value of an asset in which you have invested, such as a house or shares, either increases at a lower than expected rate or even decreases when you were expecting growth. The risk of receiving a lower than expected income return – for example, if you purchased shares and expected a dividend payout of 50 cents per share and you only received 10 cents per share. As discussed previously, the type of risks you are exposed to will be determined by the type of assets in which you choose to invest. Fixed interest and cash investments will generally be low risk (defensive assets) and assets such as property and shares are generally considered to be high risk (growth assets). What's the relationship between risk and return? Whilst we would all love to find a perfect investment which has low risk and high returns, the fact is that this doesn't exist because risk and return are positively related. This means that the lower risk investments – while good for peace of mind – will generally provide a lower long-term return than a high risk investment. The chart below shows the risk return profiles of each of the different asset classes. How do you manage investment risk? Diversification means spreading your investments across a variety of asset classes. In doing so, the positive returns you receive from one investment can generally offset any negative returns you may receive from other investments. Your investment time frame also has a significant impact on your investment decisions and, therefore, the amount of risk you take. Usually, your age and relative proximity to retirement will determine whether you're investing for the short, medium or long term. Review your plan regularly – once developed, your investment strategy should consider all aspects of your personal situation. If your circumstances change, therefore, it's important that your plan is updated accordingly. When choosing your asset allocation, it is essential that you spread your investments across different asset classes and investment products, so that all of your financial eggs are not in the one basket. Diversification is key to boosting your investment returns; the possibility of higher returns from growth assets together with the stability of lower risk defensive assets. The main benefit is that if one or two of the assets are performing poorly you have other assets that may be performing better and which could possibly balance out your losses. It's also important that your investment portfolio is diversified within, as well as, across all asset classes. How long you have to invest, or your investment time frame, is a great starting point for determining your investment strategy. long term (more than five years). Over time, investment markets move up and down as does the value of your investments. If you have many years over which to invest, you may be prepared to take on more risk. In this situation, with more time to ride out any short-term fluctuations in investment returns, you have the opportunity to benefit from the higher expected returns offered by growth investments such as shares. If, on the other hand, you only have a couple of years over which to invest, you're generally investing for the short term and security may be more important than higher returns. Accordingly, you might put a greater emphasis on placing your investments in short-term, more secure assets, such as cash and fixed interest. Longevity risk is one of the biggest risks facing retirees. It refers to the risk of outliving your savings. Longevity issues arise as people enter retirement, generally with a fixed amount of money to fund their retirement years (either in the form of a lump sum or pensions), but with no idea of how long they will live and, therefore, no idea how long their money needs to last. According to the Australian Bureau of Statistics (ABS), over the last 50 years, the life expectancy of a new-born boy increased from 66.1 years in the period 1946-48 to 80.1 years in the period 2011-13. Similarly, the life expectancy of a new-born girl increased from 70.6 to 84.3 years during the same period. How do you manage longevity risk? Account-based pensions are purchased with superannuation monies and provide an income source during retirement years. As account-based pensions are linked to the market, your investment, and therefore the income payments you receive, will be affected by market fluctuations. The risk is that the income drawn from your account-based pension is not guaranteed to last your lifetime; it depends on the initial capital invested and the return from the underlying investments. Longevity risk can, however, be managed to a certain degree by setting and adjusting the underlying investments, asset allocation and the level of income drawn each year from the pension. A product that does protect against longevity risk is a lifetime annuity or pension. A lifetime annuity is not exposed to market returns, so does not suffer in a downturn market and is a guaranteed income stream for life. Despite the certainty, however, these are unpopular because the rate of return is locked in at the time of purchase and access to funds can be restricted. Since the changes to superannuation in 2007, the value of these annuity investments has been included as an asset under Centrelink's assets test. One concept prevalent overseas is that of deferred annuities (a form of longevity insurance), which can be purchased on retirement. In this case, you must have accumulated sufficient funds from other sources (such as an account-based pension) to support you until you reach your life expectancy age. Once you reach your life expectancy age, the deferred annuity begins paying income and continues to do so for the rest of your life. Some Australian product providers are developing new income-stream products based on this principle, which can be used in conjunction with traditional income streams to provide you with an income for as long as you live. However, the benefit of using such products must be weighed against the fees and charges levied. What if you have both long-term and short-term goals? Your asset allocation will be clearly affected by your investment timeframe, therefore, it will be beneficial for you to separate your long and short-term goals, work out how much is needed for each and then determine the allocation separately. For example, you can invest for the long term in growth assets and set aside funds for the short term in a cash investment or other similar defensive asset. Therefore, you can ensure that the short-term funds are available when needed and that your longer term investments aren't hindered by significant falls in the short term. Once developed, your investment strategy should incorporate all aspects of your personal finances. It's therefore important to keep to your strategy to give yourself the greatest chance of achieving your financial goals. After all, your investment strategy has been designed to assist you over the short, medium and long-term and the success of the strategy depends on whether you adhere to it.